From left to right: Nate Wright, Katie Oxx, Dave Krueger, Jim McIntire, and Jon Pahl. For an author, it is always gratifying when someone reads your book carefully and takes the time to prepare a thoughtful response. Last week, Myths of the Rune Stone, was featured in a forum dedicated to the theme of American myths. Two historians, a sociologist, and a theologian delivered outstanding presentations on the relevance of the book for reflecting on important dimensions of U.S. history, religion, and culture. The “Why Myths Matter” forum is the second in a two-year series of forums dedicated to the theme of American myths. It was held on February 24, 2016 at the Arch Street UMC in Philadelphia PA. Click hereto view information on the entire series. Speakers are listed below along with a guide to navigate the podcast. You can fast forward using the the arrow keys on your keyboard. I hope you enjoy it! 24:50 – Dr. Jon Paul – Lutheran Theological Seminary – What about the role of fantasy and playfulness in the rune stone story? References to novelists Ole Rolvaag and Louise Erdrich. 33:00 – Dr. Nathan Wright – Bryn Mawr College – Despite the dangers of myth to exclude and dominate, they are necessary for societies to function. References to Durkheim, Bellah, and other sociologists. 45:50 – Dr. Katie Oxx – St. Joseph’s University – The ways that Catholics negotiate American identity. A comparison of the “Pope stone” and the “rune stone.” References to “new materialism.” How do material artifacts act on us? 54:00 – Rev. Jim McIntire – Havertown UMC – Myth fills a gap in public discourse. Conspiracy theorists like Scott Wolter profit handsomely from propagating myths. Reflections Joseph Campbell’s book on myths. Why do people believe myths that have been disproven by science? What is the difference between history and myth? Why have Americans fought over stories about who was here first? What does Viking enthusiasm have to do with white supremacy? 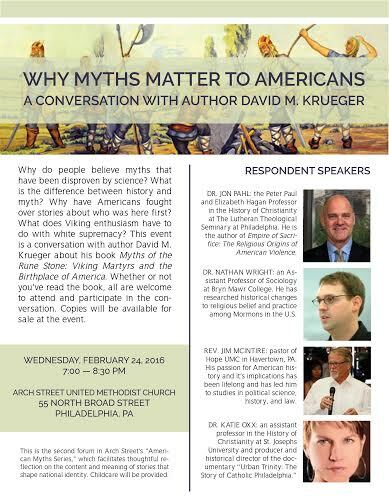 This event is a conversation with author David M. Krueger about his book Myths of the Rune Stone: Viking Martyrs and the Birthplace of America. Responding speakers include historian Jon Pahl, historian Katie Oxx, sociologist Nathan Wright, and Jim McIntire, a pastor and activist. Whether or not you’ve read the book, all are welcome to attend and participate in the conversation. Copies will be available for sale at the event and can be signed by the author. Philadelphia: NOT the Birthplace of America? Whaaaat? Philadelphia is commonly referred to as the birthplace of America. This is not surprising given that it is the location where both the Declaration of Independence and the U.S. Constitution were written. This claim, however, is contested by a small town in Minnesota. 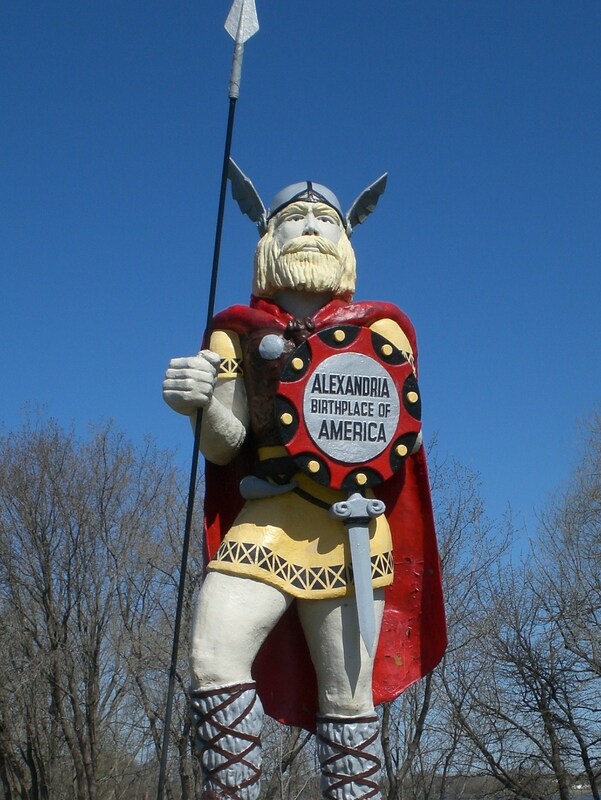 A large fiberglass Viking statue towering over Alexandria boldly declares that “America” began in what is now the American Midwest. My book Myths of the Rune Stone: Viking Martyrs and the Birthplace of America tells the story of how the unearthing of a mysterious runic artifact from an immigrant farmers’ field in 1898 inspired a myth that challenged many of the orthodoxies of U.S. history. Although the rune stone was declared by most scholars to be fraudulent, Minnesotans used the artifact to argue that their region was as significant to American history as the traditionally historic tourist destinations of Philadelphia and Boston. Read chapter three of Myths of the Rune Stone to learn more about the civic and regional aspect of the Kensington Rune Stone story. “Big Ole” the Viking in Alexandria, Minnesota. It was constructed for an exhibit at the New York World’s Fair in 1965. Last night, I had the privilege of speaking at the monthly Nerd Nite gathering held at Frankford Hall in Philadelphia’s Fishtown neighborhood. My talk centered on how the rune stone story exemplifies that America’s preoccupation with discovery myths and birthplace narratives often serve to marginalize the history of North America’s first residents. Additionally, I noted that Kensington Rune Stone phenomenon demonstrates that Americans have long struggled to discern the difference between history and myth, science and pseudoscience. I think these themes appealed to the Nerd Nite crowd, which is often comprised of grad students, scholars, and others interested in history, science and popular culture. Myths of the Rune Stone has been getting a lot of attention in Minnesota over the past month. My latest interview went out to 45 radio stations last weekend! Additionally, it has started to get national attention thanks to a review at the blog Religion Dispatches. I’m glad that the book has finally made its Philly debut. Please do contact me if you would like me to speak at an event in the Philadelphia region.